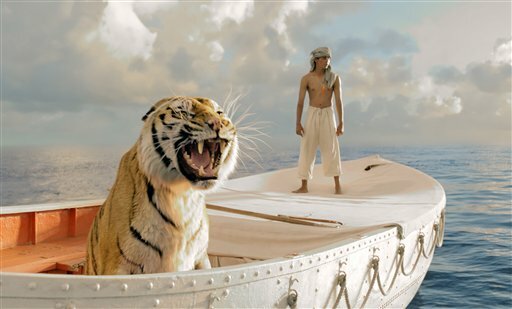 WTOP Film Critic Jason Fraley says "Life of Pi" is fascinating, albeit difficult to market. WASHINGTON – Few filmmakers are so intriguing that you can’t wait to see what they’ll do next. Ang Lee is one of them. The Taiwanese native and NYU grad has made a career of proving leopards can change their spots. Or should we say tigers? He started in romantic comedies before adapting two dramatic novels: Jane Austen’s “Sense and Sensibility (1995) and Rick Moody’s “The Ice Storm” (1997). He then became an Oscar-nominated director/producer for the action masterpiece “Crouching Tiger, Hidden Dragon” (2000). Finally, he won the Best Director Oscar for the western “Brokeback Mountain” (2005). The fact that he’s now trying to tackle a fantasy novel should be no surprise. Many said Yann Martel’s 2001 bestseller “Life of Pi” could never be adapted into a film, but I’m here to report that “never” isn’t in Lee’s vocabulary. He gives the task to screenwriter David Magee, who was nominated for Best Adapted Screenplay for his debut script “Finding Neverland” (2005). Their journey becomes a disaster at sea as a violent storm sinks the ship, stranding Pi on a lifeboat with several animals, including a 450-pound Bengal tiger named Richard Parker. Later as an adult (Irrfan Khan), Pi shares his wild, 227-day survival tale with a Canadian writer (Rafe Spall), who must decide whether he believes the story and believes in God. Thus, “Life of Pi” feels like two films, starting out as a Satyajit Ray coming of age story like “The Apu Trilogy,” and transitioning into a Rudyard Kipling tale of jungle law, a modern day Mowgli and Shere Khan trapped in a lifeboat. In order for the film to work, Lee needed to properly cast the characters in the framing device. For the adult Pi, he smartly casts Khan (“Slumdog Millionaire”), whose face shows the necessary duality between wonder and skepticism. For the part of the writer, Lee originally cast Tobey Maguire, but ultimately decided his “Spider-Man” fame would be too distracting, replacing him with the lesser known Spall (“Prometheus”). Most importantly, Lee plucked an unknown actor, 17-year-old Suraj Sharma, to play the teenage Pi. Born and raised in New Dehli, Sharma becomes a compelling hero, joining 6-year-old Quvenzhane Wallis (“Beasts of the Southern Wild”) as this year’s two unknown castaways. Of course, Sharma has plenty of help. His performance is thrust into an all- enveloping atmosphere, thanks to magnificent 3D graphics, gorgeous cinematography by Claudio Miranda (“The Curious Case of Benjamin Button”) and music by Mychael Danna (“Little Miss Sunshine,” “Moneyball”). The key player in all of this, though, is Lee, who blurs the line between water and sky in his lyrical shot selection, from underwater shots in a swimming pool, to high angle shots over reflective oceans. If 3D has a premature Mount Rushmore, it would show Cameron for his effects in “Avatar” (2009), Scorsese for his historic eye in “Hugo” (2011) and now Lee for “Life of Pi.” The 3D enhances a powerful shipwreck sequence, makes for dazzling seasick hallucinations, and forces us to jump in our seats with flying fish and precision tiger lunges. Unlike the titular cat in “Bringing Up Baby” (1938), Pi’s tiger is digitally placed next to the human actor — and we believe it entirely. While a staunch skeptic to 3D as a gimmick in recent films, I’m slowly coming around to thinking there might be a place for it. Prior to “Pi,” a trailer promoted “Jurassic Park 3D” for next spring, and considering this past April’s “Titanic 3D,” I wondered whether we’ll get a new one every spring. If so, is this necessarily a bad thing? The industry might do well by itself to continue to update history’s masterpieces in the latest technology and screen them for new audiences to see. Somewhere in this film history lies “Pi,” but where it will fall is hard to tell. It’s a difficult film to market, which is why Lee is bouncing around the globe promoting the hell out of it. Posters are touting it as “The Next Avatar,” a misleading claim considering “Pi” is much more narratively complex than “Avatar” allows itself to be. Meanwhile, the PG rating may convince parents it’s a nice kids movie about a boy and his tiger, when really its pace may leave youngsters squirming in their seats. We become “lost at sea” during the repetition of sea survival scenes, a necessary drag like the desert sun march in “Lawrence of Arabia” (1962), leading toward revelations that may be too ambiguous for a child’s mind. No, this film isn’t for kids. It’s for young-at-heart adults still searching their souls. “Life of Pi” suggests that life, like the mathematical pi, follows a scientific rhyme and reason based on infinite mystery. The film is both a Biblical tapestry of Noah, Jonah and Job, and a serious meditation on why we choose to tell — and believe — certain stories. Do we want happy or sad endings? Whimsical fantasy or bitter reality? Blind faith or the cold hard facts? The film presents us with a choice, revealing Lee as a crouching tiger, hidden genius. If the ending leaves you unsatisfied, it may be because you’re still grappling with this question yourself.